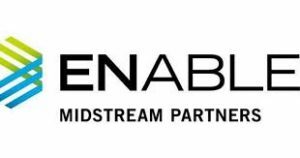 Oklahoma City’s Enable Midstream Partners, LP announced financial and operating results for fourth quarter and full-year 2018 showing all-time high for natural gas and crude oil gathered and processed, resulting in increased quarter and yearly income. Net income attributable to limited partners was $174 million for fourth quarter 2018, an increase of $66 million compared to $108 million for fourth quarter 2017. Net income attributable to common units was $165 million for fourth quarter 2018, an increase of $66 million compared to $99 million for fourth quarter 2017. Net cash provided by operating activities was $286 million for fourth quarter 2018, an increase of $8 million compared to $278 million for fourth quarter 2017. Adjusted EBITDA for fourth quarter 2018 was $271 million, an increase of $33 million compared to $238 million for fourth quarter 2017. DCF for fourth quarter 2018 was $173 million, an increase of $27 million compared to $146 million for fourth quarter 2017. Net income attributable to limited partners was $521 million for full-year 2018, an increase of $85 million compared to $436 million for full-year 2017. Net income attributable to common units was $485 million for full-year 2018, an increase of $85 million compared to $400 million for full-year 2017. Net cash provided by operating activities was $924 million for full-year 2018, an increase of $90 million compared to $834 million for full-year 2017. Adjusted EBITDA for full-year 2018 was $1,074 million, an increase of $150 million compared to $924 million for full-year 2017. DCF for full-year 2018 was $760 million, an increase of $100 million compared to $660 million for full-year 2017. For fourth quarter 2018, DCF exceeded declared distributions to common unitholders by $35 million, resulting in a distribution coverage ratio of 1.26. For full-year 2018, DCF exceeded declared distributions to common unitholders by $208 million, resulting in a distribution coverage ratio of 1.38. During fourth quarter 2018, per-day natural gas gathered volumes grew for the 12th consecutive quarter as a result of strong rig activity across Enable’s footprint. During fourth quarter 2018, Enable also achieved the highest per-day crude oil and condensate gathered volumes since its formation in May 2013. As of Feb. 12, 2019, there were fifty-four rigs across Enable’s footprint that were drilling wells expected to be connected to Enable’s gathering systems. 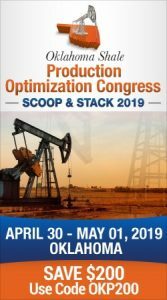 Forty of those rigs were in the Anadarko Basin, nine were in the Ark-La-Tex Basin, two were in the Arkoma Basin and three were in the Williston Basin. During fourth quarter 2018, Enable contracted or extended 600,000 Dth/d of transportation capacity, bringing total 2018 contracting to over 2,000,000 Dth/d. On the Enable Oklahoma Intrastate Transmission, LLC (EOIT) system, EOIT recontracted with its largest customer, OG&E, for five years of approximately 336,000 Dth/d firm transportation service. With this contract and EOIT’s 228,000 Dth/d contract to serve OG&E’s Muskogee Power Plant, Enable will provide over 550,000 Dth/d of firm transportation capacity to OG&E. During fourth quarter 2018, Enable placed the Muskogee project in service on time and under budget and, as previously announced, placed the CaSE project into full service.